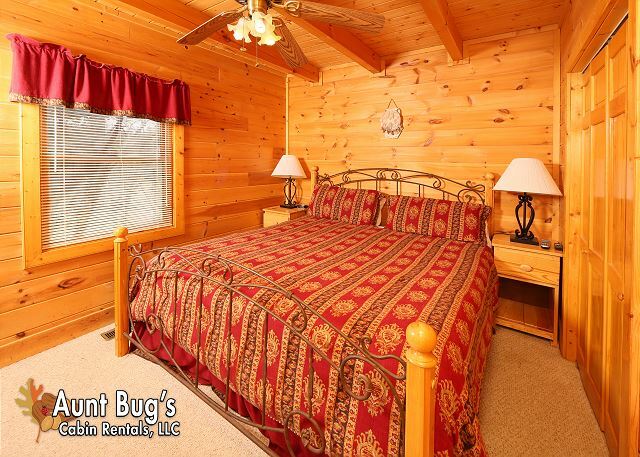 Morning Mist is a charming, comfortable and very tastefully decorated cabin that has so much to offer. 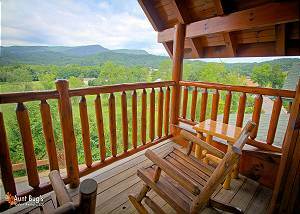 Located close to the Great Smoky Arts & Crafts Community just minutes from downtown Gatlinburg. The bear themed living room features a stone accented gas fireplace with cathedral ceilings and faux suede sofa and love seat for your comfort. Just off the living area you will find a fully equipped kitchen with every thing you'll need to cook and prepare a delicious breakfast, lunch or dinner for entire party and find a stylish wood dining table that seats 6. Also, on the main level is a beautiful king bedroom with flat screen TV and nearby full bath which is roomy enough that the washer, dryer, iron and ironing board are located in a spacious closet inside the bathroom. For your convenience, this bathroom is also accessible from the main living area of the cabin. 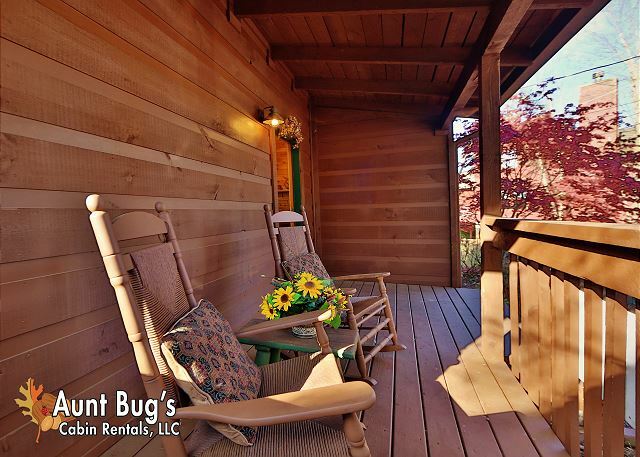 Take in the fresh mountain air, grill some burgers and steaks on the gas grill or soak away your aches and pains in the steamy outdoor covered hot tub, or if you prefer a bit more sun, step onto the adjoining open deck where you will find an attractive picnic table and benches. 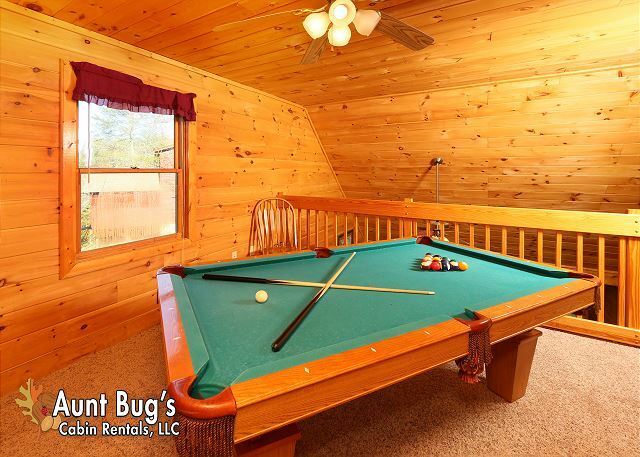 Take a quick trip upstairs and you'll enter the loft game room with a pool table that is open to the living area. Off the game room is a wonderful, sturdy king size bed with a flat screen TV mounted on the wall at the foot of the bed. Behind a privacy door is a additional sleeping area built in the dormer with a twin size bed... perfect for a young child. Adjacent to the bedroom is a full bath with attractive tile flooring and roomy shower with a corner seat. As an added convenience there is wireless internet just in case you need to check your email or browse the web. We look forward to your special mountain getaway at Morning Mist. Rate's are based on 4 adults, each additional adult is $12.50 per night. No smoking please. We stayed at Morning Mist over the Christmas Holiday. The cabin was so cozy and comfortable. We were able to cook meals in the fully equipped kitchen which was a huge plus. Everything we needed. We will certainly be staying again. We had a fantastic vacation, and we were both impressed with the cabin. It was clean, attractively decorated and there were no smelly plug-ins that I especially appreciate due to my sensitivity to fragrances. The location was ideal in the arts community, and there were plenty of restaurants if we didn't feel like driving downtown. We would definitely stay at the Morning Mist cabin again. Great place and location. 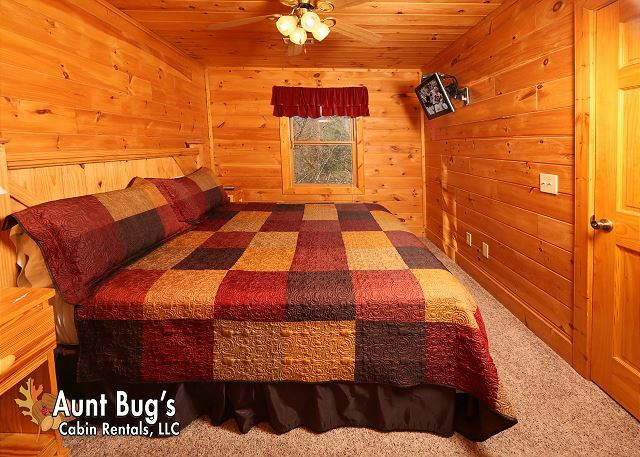 Easy to access Gatlinburg and surrounding areas. We had a wonderful stay this weekend at this cabin and would come back anytime! clean and cozy. We had a wonderful weekend getaway in the Smokey Mountains! The cabin was beautiful and the beds were so comfortable!! Just be sure you find your cabin in the light of day!! It can be tricky after dark! We had a great time at the cabin, everything was clean and ready. It was more spacious than we thought. We were not able to spend a lot of time in the cabin but it always felt good to be back in the cabin to rest. Kitchen was fully equipped. The route can be tricky at night for the first time otherwise we followed the GPS and Google maps directions and it directed us well. The written instructions given by Aunt bugs at check-in had a little mistake where it says 1.6 miles , instead of 3.6 miles to Glades road. This was an absolutely beautiful property but very difficult to locate. We would definitely stay again if it were easier to find. Directions were incorrect. Where it said to drive 1.6 miles it is actually 3.6! Absolutely loved it. Comfortable beds. We commented that it would have been nice to have a recliner. There was a board off the coffee table revealing protruding screws. We reported it and said we would be careful and they could repair later. The guy I spoke with seemed genuinely concerned. We truly enjoyed our time in the Gatlinburg area and the cabin was great. They need to check the cable and TV situation...the bedrooms didn't have proper remotes or cable boxes so we weren't able to watch. But for such a short stay that was okay for us. Directions could have been better, but when we did finally find it, we were just charmed. Spotlessly clean, very comfortable, loved the back deck and hot tub. My city husband liked this because he was in a "neighborhood" and I liked it because the trees made us feel like we were more isolated. 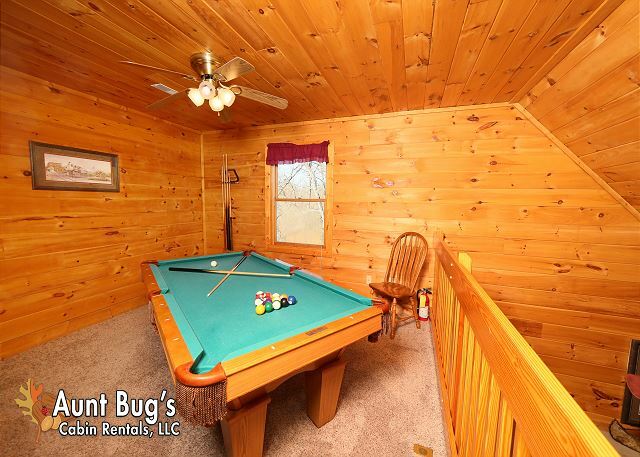 Wonderful, only thing was not enough room upstairs for pool table . Other then that. A+. 10. ?????????? We had a good stay in our cabin. It was clean and the staff was very nice. We would recommend the cabin to others. Near to Dollywood, The Island, Paula Deens, just to name a few. Wonderful time away with family. It was a very good experience staying at this cabin. It was clean, but need to some kitchen items like Peeler, Oven cleaning spray etc. Also, it needs a name of the house in front of the house along with the house number. It was very good, and friendly staff and beautiful cabin we did enjoy our stay! The cabin was very nice, the downstairs bedroom we couldn’t watch the tv. The remote in there was for a lg DVD player., so I couldn’t change the channels or anything. The mattress in the master bedroom was hard, and difficult to sleep on. There weren’t enough towels provided to our stay. We had to wash our on towels, which wasn’t expected. Very spacious and clean house. Great location. Easy check in and out. We enjoyed our stay! Was a great stay,enjoyed the ammenets,cabin had everything we needed,will be back. Our cabin Morning Mist was the perfect touch of cozy for a Tennessee Christmas. We even made a friend, Skully the squirrel who would arrive every noting for his mini muffin. We will certainly stay again. The cabin was a 5 star memory! Just as described and the cleanest cabin we have ever stayed in. Location was just what we wanted, close to everything we wanted to do. People who are renting this cabin need to know that construction is going on during the week and it does get very loud in the mornings. Sound of progress but not great for sleeping in. We will be back, thanks! Customer service is A+..very friendly staff and although we weren't completely happy about our hot tub situation we loved the cabin! Spotlessly clean, very comfortable. Great experience overall. Would have liked clearer directions to cabin, with landmarks instead of just mileage! Loved the cabin. Very comfy beds. Perfect size for 5 people. Hot tub was inviting. We loved our stay.The repairman was there in no time to help us with problems..We would go back in a heartbeat.Loved every minute! The cabin was lovely and the beds were so comfortable! I would suggest you find this cabin during daylight as the roads are very confusing! We only got to stay for two nights but I would recommend Aunt Bugs to everyone! All good except there were no numbers visible on the cabin. It was very hard to find in the dark. Also the headboard in the downstairs bedroom is very wobbly. Everything was exactly as promised. Check-in and check-out couldn't be smoother. When checking in the ladies were very nice and answered all our questions to the fullest and the cabin was perfect and everything was clean and perfect. Highly recommended!! The cabin was beautiful and very clean! The staff was very helpful.